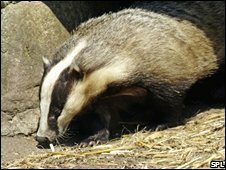 Badgers in the wild will be vaccinated against bovine tuberculosis for the first time next year. 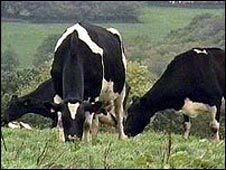 The vaccine will be tested in six areas in England where cattle are badly affected by the disease. The project, announced by Environment Secretary Hilary Benn, is aimed at assessing the practicality of injecting the animals. Farmers and vets will be among those trained in how to trap badgers in metal cages and then inject them. The animals will be marked to reduce the risk they are vaccinated more than once. The Department of Environment, Food and Rural Affairs (Defra) will begin to sign up and train participants later this year. Vaccination is expected to start in summer 2010 and continue for at least five years. This will be the first practical use of a vaccine outside research trials. It is the latest stage in Defra's plan to focus on vaccination rather than culling to tackle bovine TB in England's badger population. Badgers are blamed by many farmers for spreading the disease which affects cattle. The worst areas are in the south west and west of England, as well as Wales. The government has been accused of 'dithering' by the Conservatives, who are calling for a targeted cull of infected badgers. Shadow agriculture minister Jim Paice condemned the idea of being willing to wait five years while vaccines are tested. Mr Paice said: "By then every county could be infected and the number of cattle slaughtered could easily exceed 50,000 a year. Bovine TB is spreading from county to county at enormous cost to both farmers and taxpayers who are ultimately footing the bill." Defra's approach contrasts with that of the Welsh Assembly Government, which announced last year that in principle it favoured a large-scale badger cull as part of a package of measures against bovine TB. The Welsh Assembly Government is expected to announce further details of its plans by the end of the month. The National Farmers' Union (NFU) welcomed the announcement as "a good step forward". But the union warned "there are major hurdles to overcome in terms of practicality, cost and legislation". The NFU spokesman added: "Vaccination on its own will not stem the progression of bovine TB. It can only be seen as one of the tools in the box - a component of a multi-faceted approach to TB eradication." The move has also been welcomed by the Badger Trust, a charity which promotes the welfare of badgers and argues that it is cattle themselves which mainly transmit the disease. The Trust's chairman David Williams said: "We hope that this vaccine will give badgers further protection from bovine TB, which continues to be spread by cattle because the TB testing regime is inadequately enforced."